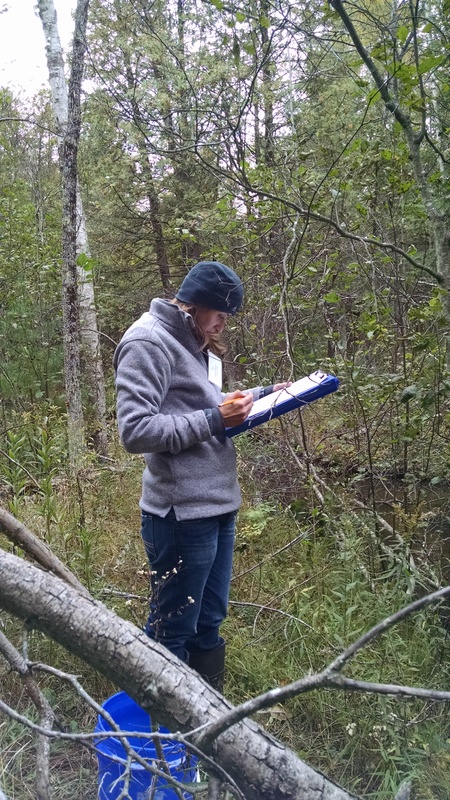 Now: I work with the MN DNR as a Private lands forester. Much like in Michigan my passion and work is to assist private landowners with sound forest management. 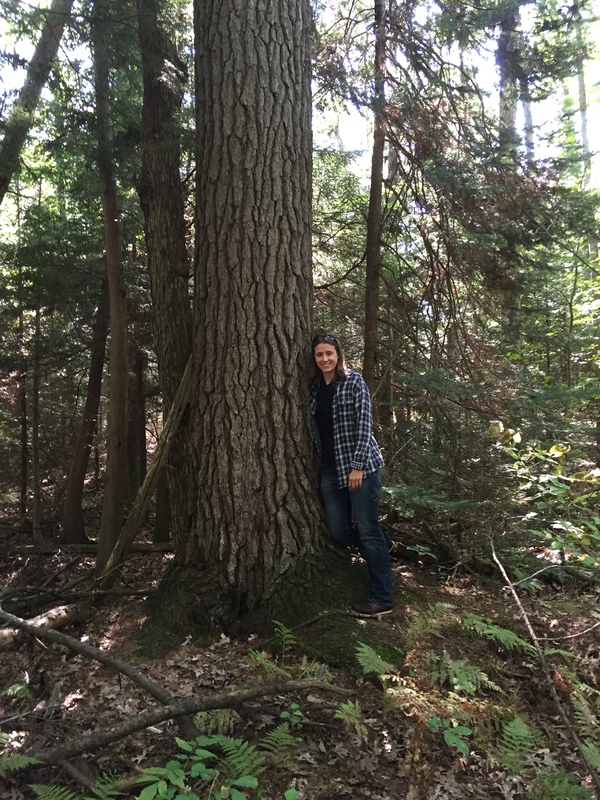 Past: I work for the Clare and Gladwin Conservation Districts in Michigan and through my experiences so far with this career I have heard many times I should be writing this stuff down or blogging about it. So here I am...sharing my crazy, wonderful, adventurous experiences with anyone who wants! Do you ever sit under a tree and think about how it got there? Was it a volunteer, meaning did it naturally regenerate and grow there? Or did someone years ago, maybe decades ago plant it? Did someone take the time to dig a hole and plant a seedling tree- hoping that one day it will grow up big and strong in hopes that someone sits under it and wonders or that wildlife is enriched by all the trees benefits. Seriously…how did it get there, what has the tree seen, what kind of tree is it even!? If only trees could talk; the stories they would tell! Would you take the time to listen? A few days ago I had a couple stop by the office carrying a large garbage bag and inside was a tree branch! They began to tell me about the tree and how they had 35 acres of these trees! I looked at it, felt the needles and said well “its a spruce, but I do not want to give exact species without seeing them”. They had told me that the previous owner planted some 13,000 of these for a Christmas Tree Farm, but passed and the wife did not keep up with it so they just grew. I did not want to confirm the exact species because partly I wanted to see these trees in real life and because I was not 100% certain on it, I told them I did not want to say white spruce and be wrong, in the back of my mind I knew it wasn’t. It was very bright green..but all I could think was black or white spruce for holiday trees but I just had a feeling it wasn’t because the branching and the pure green color. In the back of my mind I am thinking can this really be a Norway Spruce and is just a young or upper branch? But, Norway is not a common holiday tree here… This was a brain teaser at best! 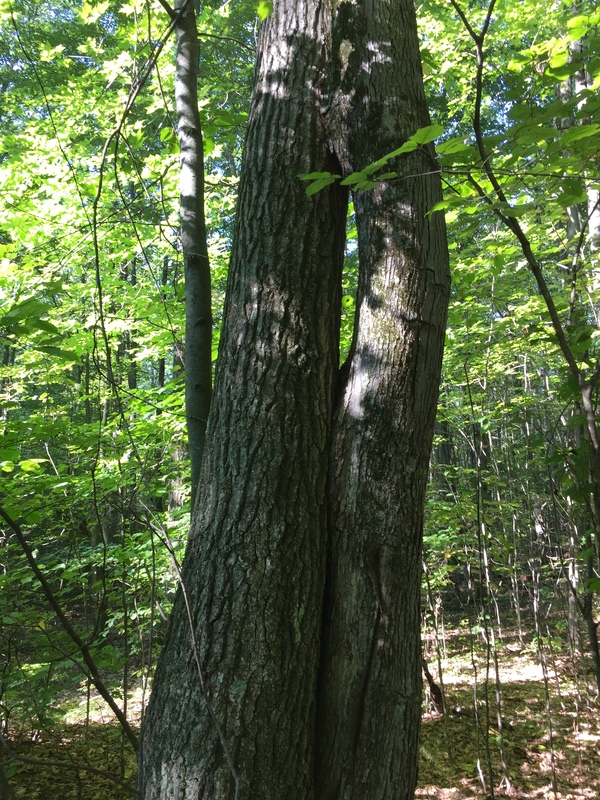 I could not get it off my mind, so I talked it out with a friend…walking through all the trees it could be. Anywho, so as I drove through the muddy back-roads to their property, it hit me like a cold snowball in the face and I yelled (all alone in my truck) I KNEW IT!! As I pulled into their driveway I had the biggest smile on my face because right in front of me, plain as day, rows and rows and rows of NORWAY SPRUCE!!! I met up with the landowners and said, I am so happy I did not let you leave my office without setting up a visit-because these are Norway Spruce. In shock we began to walk towards the trees and I explained how Norway’s branches droop down. I have never seen a plantation of these species before, I was in awe. It was a beautiful day, reaching 64 degrees Fahrenheit but when we walked into the trees it dropped roughly 10 degrees! This beautiful, green carpet of trees stand tall all because some 26 years ago a gentleman decided to plant 13,000 trees! 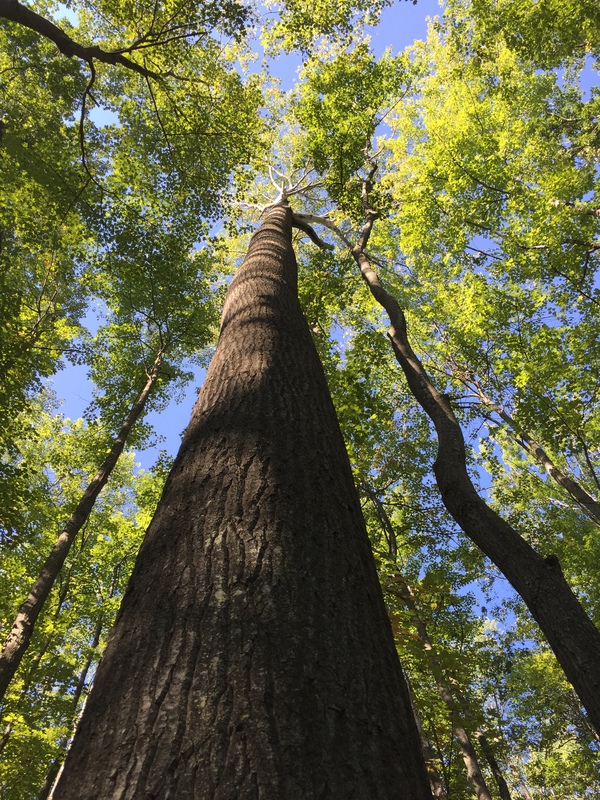 Next time you pass a tree on a walk/run/bike or sit under one to cool down and take in its shady canopy take a moment to think- how did it get there? What has it seen? What species of tree is it? If you do not know what species of tree it is, take a picture or note things about it and go that extra step to look it up! Splish Splash & Bug hunting! This past weekend I had the opportunity to volunteer with a local conservancy that received a grant to help monitor the Cedar River. 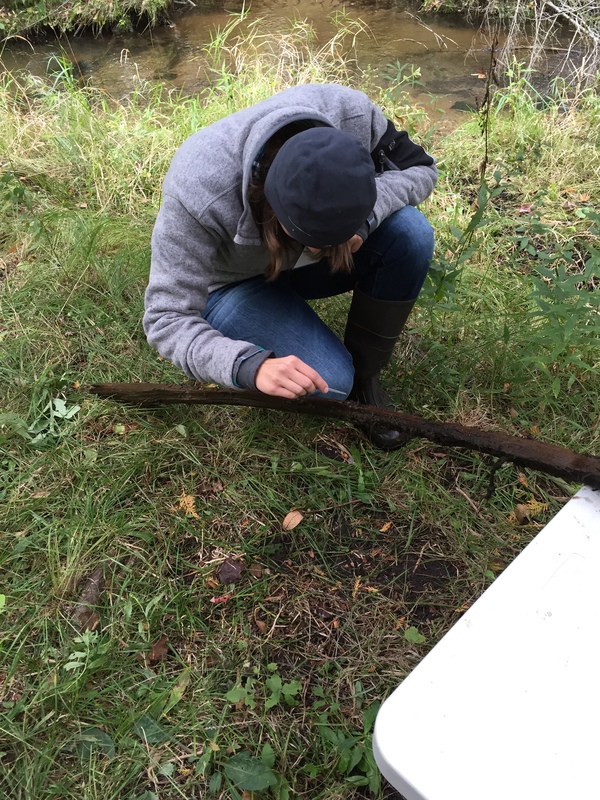 The grant is provided by MICorps (The Michigan Clean Water Corps) to monitor streams around Michigan to assess the streams quality. Anyways, it was only 50 degrees out with cloud cover, some drizzling rain, and rather windy– but we put on our boots and headed out to our site. 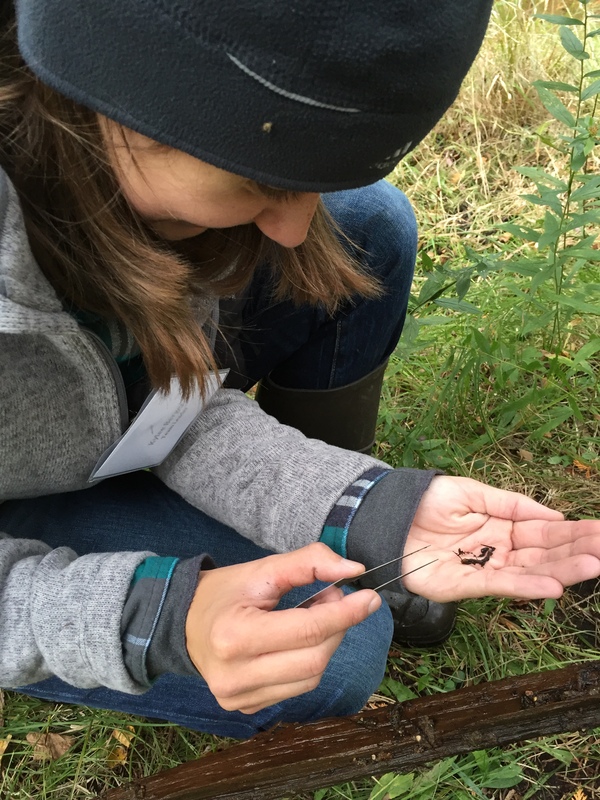 I am always up for anything outdoors, but it even surprised me when I signed up to lead a team on searching for macro-invertebrates, you know…bugs! I do not really have a problem with bugs, but I have no clue what is living in the water, peel back some bark I know what I will find but to search the stream was new to me. 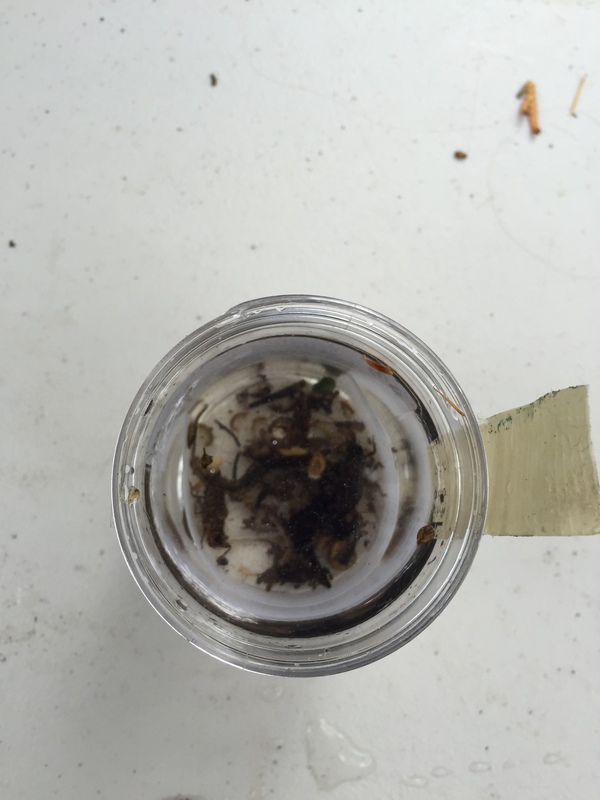 I had done some work with macro-invertebrates back in college but not as extensive as this. Anyways, so we are setting up, wind blowing our hair and I begin the timer! T (the collector of my group) headed into the stream net in hand and began to search under logs, under vegetation, moving the sandy substrate below to toss up anything living! As she would get things I would collect it and take it back to “H” who was sorting through and trying to locate little fellas! Because we were short handed and only had 30 minutes to search the stream, I helped out both T and H with their duties. I began sifting through vegetation and sand looking for anything that moved. Then I hit the mother load! An old branch that had fallen in the stream and made home there in the stream; had loads of little critters crawling! We picked and picked and picked and finally we felt confident that we had close to 100 macro invertebrates and began to identify what exactly we had and classified it to get a measurement of quality for the stream. In our section we found that it was ranked excellent. By what we found in the stream rated it healthy. We even found a little tadpole, but we let it go! The stream was very clear and had great buffer zones of trees and other shrubs to keep it cool and clean. Trees and shrubs allow for stability of the banks that prevent erosion of sediment, pesticides, nitrogen and other pollutants into the stream. If its a cold water stream that houses trout, it is crucial to keep the temperature down but shade trees in order to keep providing that habitat for trout. It is important for us to monitor these streams, not only for water quality for ourselves but also for the wildlife using the stream. As we continue to add more “plots” and monitor more sections of the stream we can asses the watershed as a whole and if any management needs to be addressed. 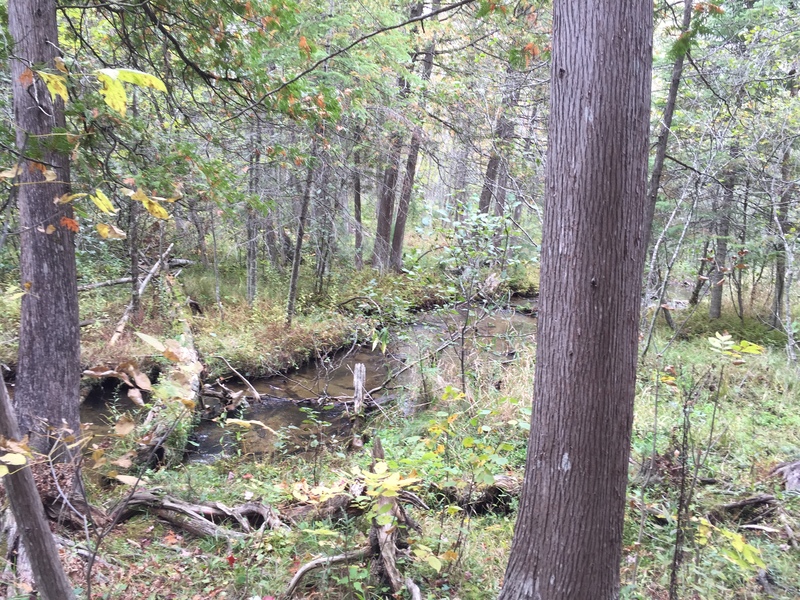 So as the stream flowed and the cedar trees broke the silence– we three enjoyed the wilderness of the stream, forest and wildlife that surrounded us. We left the stream and stream bank un harmed- it was like we were not even there with the exception of T’s large boot hole where she sunk into the muck! View of our section of the steam- we did 300ft of stream. There is a bug in my hand- just hard to see with the other little vegetation piece. Solid proof- that I do work!